You Don’t Own Enough of This Investment. Buy More Now! You’ve seen crude prices soar the past few weeks. And we’ll feel that surge as a pinch in our wallets when we go to the gas pump this summer. Indeed, you’re probably already feeling it. The average price for gasoline in the U.S. just hit $2.85 per gallon. Source: American Automobile Association Click image for a larger view. That’s the highest level in three years. Ouch! But what if I told you there was a way to hedge yourself against rising gasoline prices? Despite the surge in oil and gasoline, many talking heads on Wall Street will tell you the energy rally is already done. Priced in. Kaput. Well, don’t you believe them. I have the straight scoop for you today. There are great reasons to buy energy stocks right now, even though the U.S. crude oil benchmark has rallied 65% since last summer and 17% so far this year. And I’ll tell you an easy way to do it. First, let’s talk about what’s driving oil prices higher. The primary reason is NOT U.S. sanctions on Iran. That’s just a small piece of the puzzle. There are THREE other strong forces at work here. 1. 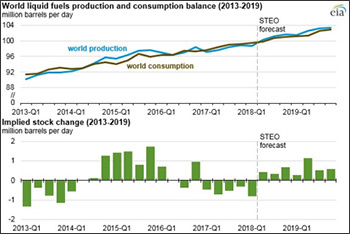 Falling Global Oil Inventories. U.S. inventories of crude oil are falling fast. The U.S. Energy Information Administration just reported that crude inventories dropped by 2.2 million barrels in the latest week. That was versus consensus for a 700,000 barrel drop. Plus, as we move into summer driving season, refineries need more oil to turn into gasoline. B) Forecasts it into 2019. Right now, the world is facing a DEFICIT of oil. That means we are using more than the world’s oil wells produce. This might change in early 2019, if forecasts hold true. Then again, the EIA can often be optimistic. The global economy grew 3.8% in 2017. That’s the fastest rate since 2011. And it was an upside surprise for almost everybody. Well, hold on to your hats. Economies around the world are revving their engines. Indeed, Goldman Sachs says that global GDP growth could hit 4.1% in 2018. 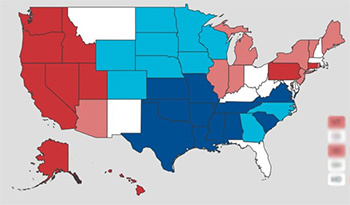 This could be led by a surge of growth in the U.S. Since Goldman was one of the few that got 2017 right, you might want to listen to them on this. 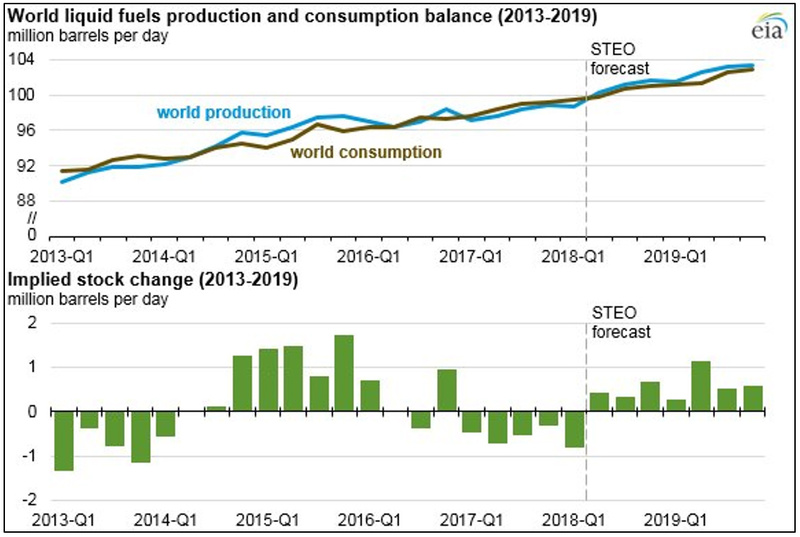 Now, what does that mean for oil demand? More growth means more oil use. So oil demand will accelerate — probably faster than the EIA is expecting. And there’s one more factor to consider. Saudi Arabia is now actively pushing for higher prices. The Saudis already have helped drive oil prices up sharply in the past year. So, the chance of them meeting their new goal are pretty good. The Saudis want higher prices because they want to get the best possible price for the upcoming IPO of their national oil company, Saudi Aramco. There are many ways to play this trend. You can do the research and hard work and buy the stock of a company leveraged to the price of oil. Or you can just buy an ETF that is leveraged to those stocks. Now, you might think I’m going to recommend the Energy Select Sector SPDR ETF (NYSE: XLE). If that’s what you’re thinking, I will reach right through this computer screen and slap you. Sure, the XLE is fine as far as it goes. But 22% of its portfolio is ExxonMobil (NYSE: XOM). Another 17% is Chevron (NYSE: CVX). That is 39% of the entire ETF in just two stocks. The point of an ETF is to avoid single-stock risk. So, maybe steer clear of the XLE. Here are some other ideas. 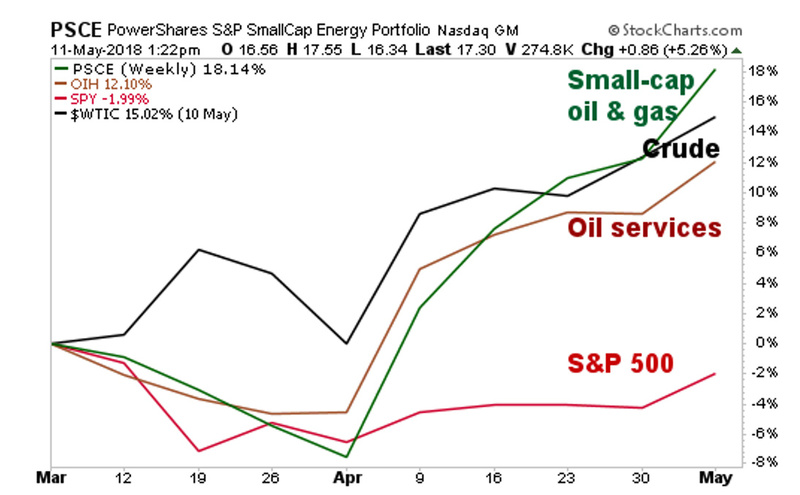 Let me show you a chart of crude oil, the S&P 500 and two leading oil stock ETFs. Over the past three months, crude oil is up 15%. That’s good. It’s certainly beating the pants off the S&P 500. The giant market index is down 2% at the same time. 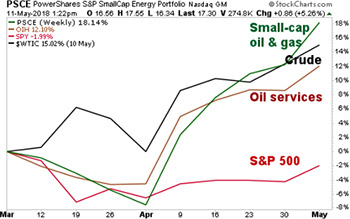 The leader now is the PowerShares S&P SmallCap Energy Portfolio (NYSE: PSCE). It’s up 18% in three months. And the VanEck Oil Services ETF (NYSE: OIH) is up 12.1% at the same time. So why do I put the OIH here if the PSCE is doing so well? Because during oil’s recent bull run, the major oil companies underinvested in drilling. Despite the surge in oil prices since last year, drilling budgets at the big global oil-and-gas companies are up only about 7%. That’s according to consultancy Wood Mackenzie. So, the OIH may be lagging a little bit for now. But it could really outperform in the months ahead. Whatever you buy, do your own due diligence. And buy now. Because when oil prices go higher, you’ll wish you had. Where the Gold and Silver is heading and which one to buy? So will you recommend either or both of these in Wealth Supercycle or Supercycle Investor? Good suggestion I must say. Can I, in Nigeria, buy any shares in the United States? If it’s possible, please tell me the steps to follow. If not possible, please, how can I invest in the Nigerian energy market?